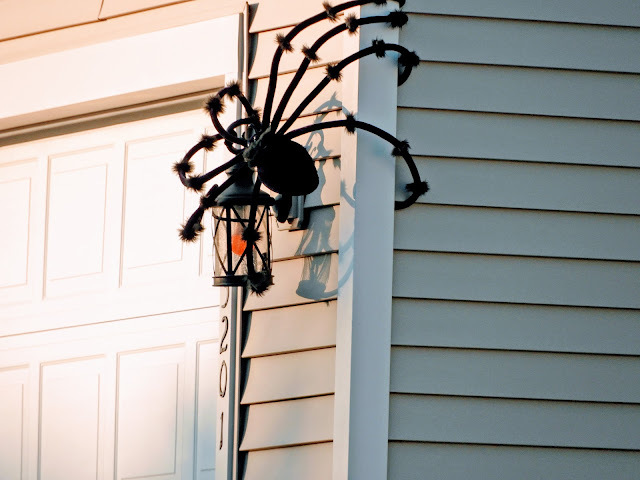 Up the street a house has been taken over with spiders. I finally go shots of them as they crawl all over their house. Fortunately they won’t be spreading to other houses like they do in the movies. 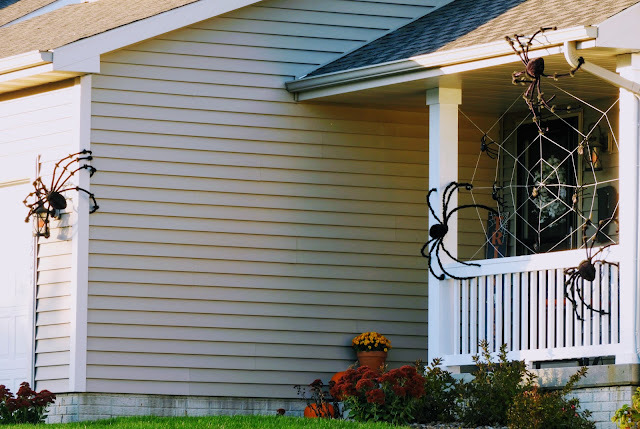 It is a young family with three young children that really have decorated the house for the coming holiday. The spiders are on the upper story too trying to get into the windows. The bad thing about tulips is there is no immediate reward for planting them. I planted red and white tulips here and some Rembrandt tulips too. I have nothing to show for right now. I do get a good feeling that once I plant them they will be there forever, blooming spring after spring. I planted 24 of them yesterday and I still have 35 more to go. I am finding places to put them but the former owner put weed barrier fabric everywhere. I can dig along the edge of the beds and get them into soil. I may get some more done today. If I plant ten or more at a time I can chip away at the total number. 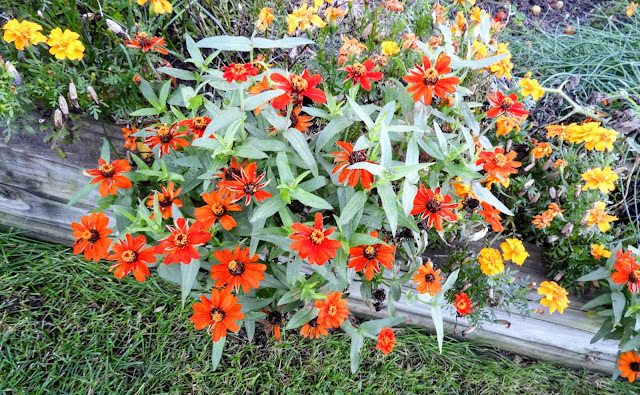 I am really sold on this zinni-like flower that they sell among the marigolds. It is staying in bloom along with the marigolds. I know the days are numbered when they will all be frozen and killed. 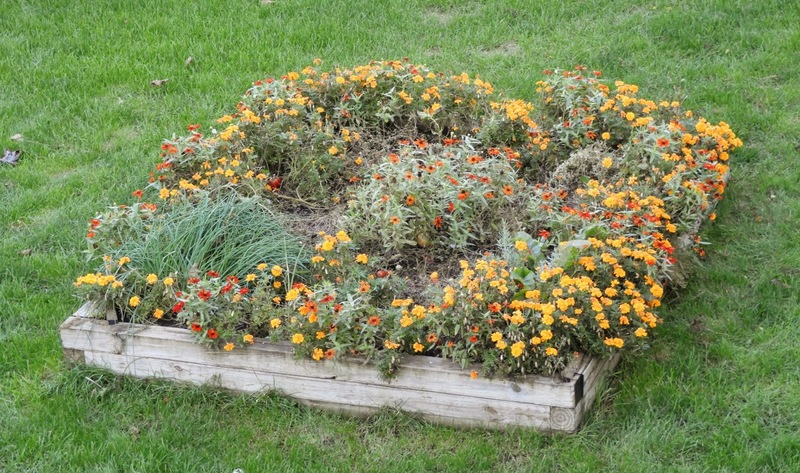 I will probably keep this as a vegetable garden even though the flowers decorate the outside edge. I could plant more than just tomatoes here but it is a great height for me to make tomato picking easier. 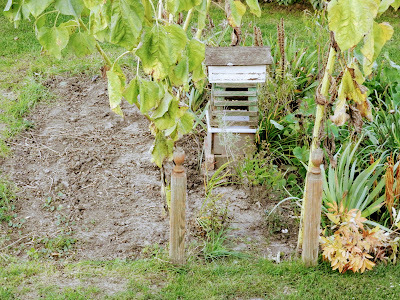 My neighbor to the northwest have two of these raised beds up against the back of their house. Their yard is a sloping hill so it is flatter for them right next to the house. My downstairs plants don’t get as much attention as they should. Sometimes I just have to take them to the sink and soak up with lots of water because I didn’t get them watered. It is strange that I have this flaking white pot and I could never tell you where it originated. I don’t know if I picked up a batch at a garage sale or inherited from my parents. 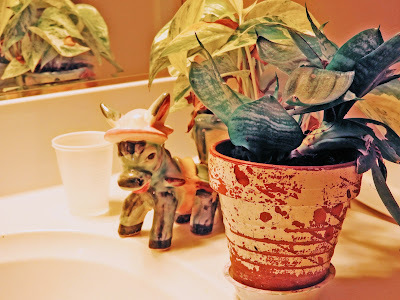 I like the look which is so different than the glazed ceramic donkey with its vine growing out of its basket. The red fired clay brick has four holes in the end of it. The dirt and the vine have done well after being there a year. 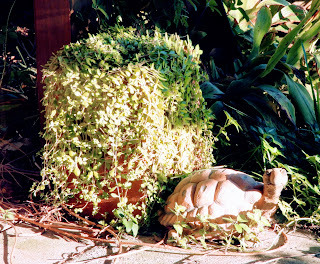 The turtle seems to be a permanent fixture next to the square vine. The wind is blowing cold from out of the north today. I don’t know if I can get outside today to work on the tulip planting. I am going to start taking a few sunflower stalks down at a time. I wish you all to have a great day today. Thanks for stopping by today. I wish I had the time and money to decorate for the different holidays. I have been putting a different welcome sign on the front door. I am going to try to put some decorations outside for Christmas this years. Their house looks good and I like your garden.